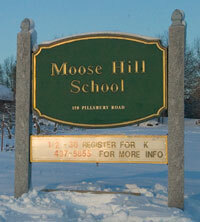 Moose Hill School opened its doors for the 2001-2002 school year. It is designed specifically for pre-school and kindergarten children with room for expansion, if needed in the future. Moose Hill has 16 classrooms, eight rooms are used for kindergarten, five are used for LEEP, one is used for our library, one is used for special education and one is used for the reading program. We have a Sensory Motor Room for our LEEP students. We have a pre-school playground as well as a kindergarten playground and an all-purpose field. Moose Hill School provides a half day Kindergarten program with a morning and an afternoon session in an environment that educates the whole child through positive social, physical and academic experiences. Sessions meet for two and one half hours. Each classroom has a certified teacher and an instructional assistant, which allows for smaller “learning communities” within the classroom. Instructional programs are designed to meet the individual needs of the students. Moose Hill School seeks to develop a community of learners composed of students and staff who are effective users of ideas and information. We are a committed partnership with the paramount focus of positively affecting a child’s intellectual, physical, social, and emotional development, that he or she may reach their full potential. LEEP – the Londonderry Early Education Program for children ages 3–5 with special needs. Programming for students with educational disabilities is highly individualized with the idea that all students are included in the regular curriculum as much as deemed appropriate. Programs for these students currently include: individual and small group tutoring either in the classroom or in a Special Education environment, classroom support, full inclusion with modifications to regular curriculum, and extended day programs. Other services include speech/language therapy, occupational therapy, and physical therapy. The library collection at Moose Hill is designed to begin to foster a love of reading by young children. In addition to the book collection of 4321 (6/30/09), a variety of instructional materials, audio visual and computer technologies are available for teachers. There is a least one computer with network access in each instructional area. Assistive/adaptive technologies are provided for youngsters in our LEEP program. Moose Hill School has a very active Parent Teacher Association. The PTA helps to facilitate volunteers in and out of the classroom. Volunteers are welcome and encouraged to assist with the instructional programs as well as social events. The PTA meets on the third Thursday of each month. Moose Hill School takes part in an activity in each of the Londonderry elementary schools as a way to encourage our students to visit and see the school they will be attending in the future. Moose Hill School invites the elementary principals and assistant principals to pajama night to read to our students as a way to familiarize our students with administrators in the school they will be attending in the future. Moose Hill takes part in several community outreach programs during the school year such as collecting canned goods for the soup kitchen, Pennies for Patients, etc. Moose Hill School opened in August of 2001.